Learn how to use the most popular office intergration tools that this powerful software offers. This course will cover the basic concepts of Acrobat, but also give you a solid working knowledge to continue your mastery of the application. The skills learned in this course will be a good start for those seeking their Adobe certification. If you want to take your Acrobat forms to the next step LiveCycle Designer will allow you to create static, interactive and dynamic forms. Adobe® LiveCycle™ Designer software enables organizations to intelligently capture information to streamline form-driven business processes through automation. After the completion of this course, you will be able to create static and dynamic interactive forms that can reduce data collection and processing errors, and enhance the user experience. The course will start with an introduction to the basics of form design and will follow with more advanced techniques that enable you to add intelligence to your form and to create dynamic layouts that react to the data or to user interactions. No doubt you have heard that Acrobat 9 offers some revolutionary new tools for creating forms. If you are still filling out forms by hand and then rekeying the information, stop right now, and call us to book this class. We also offer an ROI that will help you justify not only the cost of the course but how much money your company will save in the years to come by going paperless. 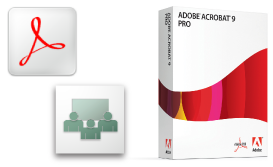 In this training, students will learn how to create and host an Adobe Acrobat Connect Professional meeting, and will cover topics including scheduling meetings; displaying content in meetings; using audio and video during meetings; customizing the meeting room; interacting with participants; recording meetings; and creating and managing Adobe Connect Events. In addition to teaching methodology, the course focuses strongly on best practices for hosting meetings and managing associated content. The course also includes optional content for recording a demonstration and interactive simulation using the Adobe Captivate application. Create a simple form with LiveCycle Designer. Creating a Custom Library group. The importance of form design. Create a form from start to finish. Share your screen to show off your work. Adding simple calculations to total fields, multiply fields. Using the Form Tracker to see all returned forms. Send a collection of form data to Excel from the Portfolio. Place all your forms in an easy to navigate Portfolio for projects such as student enrollment, field trip package, registration conference portfolio. Create a form from start to finish. Share your screen to show off your work. courseware to meet your specific Acrobat needs. be able to read minds. The comfortable atmosphere and the instructor's authentic concern for student's progress made this training rewarding and valuable.